My mom's side of the family are Ilocanos while dad from the Tagalog region, Mindoro. Mom cooks delicious pinakbet while my dad used to whipped up a soupy dinengdeng. But apart from that Ilocano and Tagalog dishes, I fell in love with the food from the Bicol region even if most of these dishes are hot and spicy. Unfortunately, my husband don't like both pinakbet and laing. He's not a fan of spicy and dishes cooked with coconut milk dishes. But that did not stopped me from cooking my favorite Pinoy ulam in coconut milk. I've been trying to master a Bicolano dish called laing. It's my uncle Ceasar whose wife is a Bicolana perfectly cooks delicious laing for the family. I learned how to cook ginataang gulay (vegetable with coconut milk), chicken curry and the recent was Ginataang Manok with Sayote and Malunggay. 1. Clean chicken. Remove skin and fatty portion. 2. Boil chicken. Set aside stock. 3. Slice onion, garlic and ginger. 1. In a pot, saute onion, garlic and ginger. 2. Add chicken, cook until brown. 3. Add 1 cup coconut. Let it simmer. 5. Let it boil then add sayote. Little iodized salt and pepper to taste. 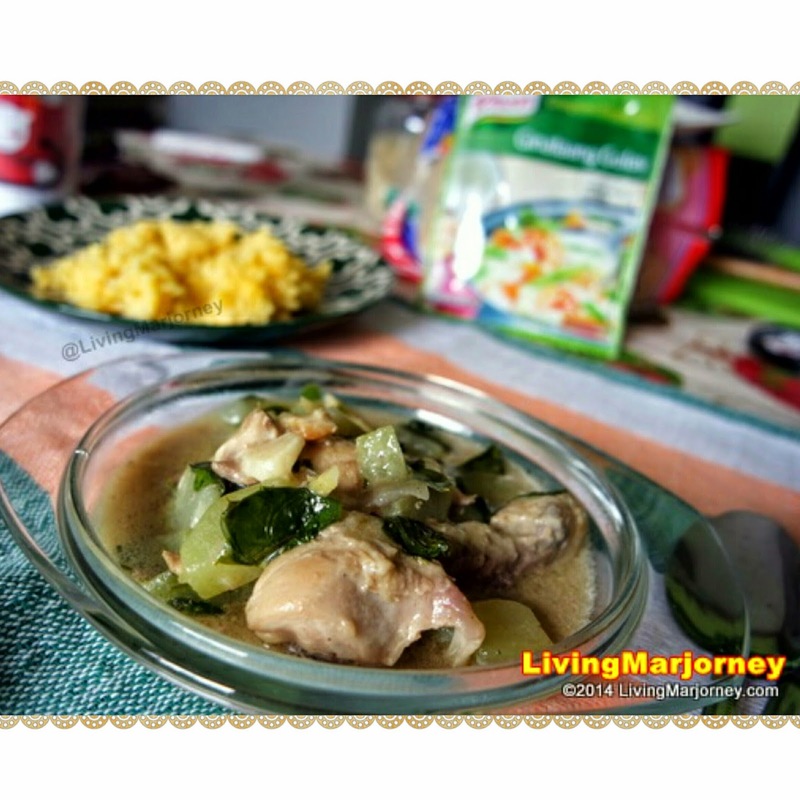 What do you think of my Ginataang Manok with Sayote and Malunggay? It's one of my favorite Filipino dish because we simply love to add freshly squeezed coconut milk to our dish. It's easy to prepare and the ingredients are readily available. If you're too busy to prepare the coconut milk, you may use coconut milk in powdered form. They are available in most supermarket and grocery stores. Stay tuned for more coconut milk dishes as I explore the province of Bicol in the coming weeks.